The Guild of Taxidermists held a seminar at Sutton Bonington this is one of the the mid year meeting we have. 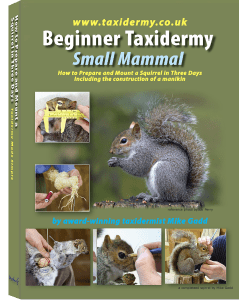 I did a demonstration on Grey Squirrel Taxidermy to promote the new Book “Beginner Small Mammal Taxidermy ” showing the flexibility of woodwool as a manikin medium. There is now an article on the Guild of Taxidermists website. 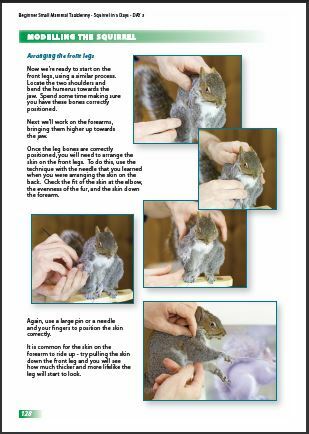 “Instead of rushing straight in and skinning the specimen take the time to see how it moves naturally” Mike explained The Squirrel had suffered internal injuries as a result of a RTA. So Mike explained how he had used acetone and alcohol to kill any bacteria and prevent the skin from slipping around its belly area. This had worked extremely well and there was no sign of hair loss. Mike then proceeded to skin the squirrel after a short debate on the various types of incision that would work on such small specimens and the pro’s and con’s of each option, a straight forward belly incision was opted for on this occasion. The benefits of using a knife as opposed to a scalpel were also discussed. Removal of the skin commenced and in no time at all Mike had skinned right to the tips of the toes and had a neat skin ready to do some fine paring of the ears, eyelids and lips before placing it into the tan solution. 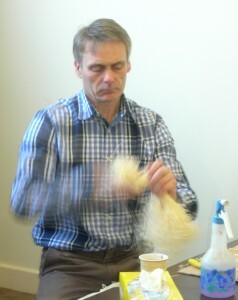 After lunch Mick began to create a mannequin for the squirrel useing woodwool. Mike now turned his attention back to the skin and demonstrated fleshing to reduce shrinkage when drying . 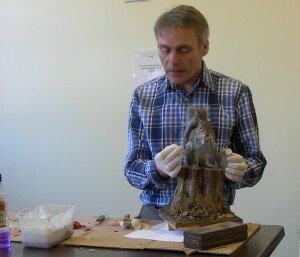 The day was drawn to an end with Mike demonstrating how he fine tunes the skin and uses good referance to re-create an exceptionally lifelike squirrel. If you are a beginner or interested in wood wool bind-up mannequin making this is a good book for you.